4-15-05 – And your fine patience shall be rewarded. Greetings, comrades! As I write this first update of the season it is a glorious and sunny 65 degrees in the Twin Cities, as fine a mid-April day as could be found anywhere on the planet. Winter, as long and insufferable as a Disney World parade, has released its frigid fingers from my humble patch of tundra and given ground to blessed spring. 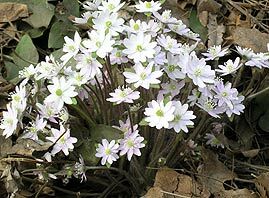 Pretty little Pasque flower (Anemone pulsatilla) is in full bloom, as are the elegant, Zone 2-hardy scillas (Scilla siberica) that dodge and weave throughout my landscape. It’s such an exquisite example of the pandering, avarice-driven, disrespectful motives espoused by portions of the American gardening industry. “Our exclusive garden in a box makes it simple” sums up their true opinion of today’s American gardener: You’re too busy, too lazy, and way too stupid to learn about garden design, so send us $125 and we’ll ship you your next garden via UPS. Plunk it in according to the diagram, and boy, won’t you be proud. “BUY IT, PLANT IT, WATCH IT GROW!” Do you sense what they’re NOT saying? Don’t learn, don’t investigate, don’t experiment, don’t decide which perennials you love, or those you hate. Don’t worry about your soil, don’t think about disease, don’t even water the thing, for that matter … just buy it, plant it, and watch it grow. But when it comes to the “watch it grow” part, you’d better set up a sturdy tent and stock up on canned food and Sterno. The plants are shipped in “three-inch pots or as dormant crowns.” These are tiny perennials. This thing is going to start looking like something toward the tail end of ’09. Plant size was all decided around price point, by the way. Their research tells them that $124.95 is the ideal price for an “instant garden” offer to stupid, lazy American homeowners. Any higher and the thing won’t sell. Any lower and it cuts into the profit (I figure the profit on this thing is around seventy bucks). So they include potted perennials that will arrive each about the size of a parsley sprig, and crowns no bigger than a cocktail wiener. 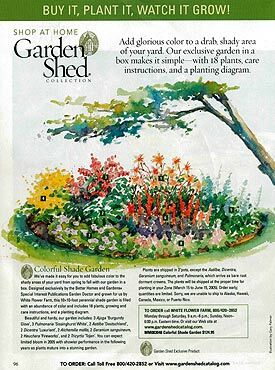 Perhaps the worst thing – and neither the magazine nor the nursery have even thought of this – is that people are going to plant this right in the middle of their yards. They’ll have a shady back yard with thin grass, and this garden will land like a one-seat flying saucer that was running low on fuel. There will be no landscape, per se, no connection to what already exists, no sense that this garden flows from a whole-yard landscape design. Go down this “simple, easy” road as a gardener, and the one thing that will never grow is you. Fake rock (read: plastic) waterfalls are all the rage in 2005, even though you’ll not find a single one out there capable of providing your landscape with a raging waterfall. These miniscule, one-piece, plastic waterfalls are an embarrassment to the American gardening scene, and I trust that those of you who are regular visitors to this site will agree. Looking at the photo, why am I reminded of the line from This is Spinal Tap, when the bands’ manager thunders, “Have you ever SEEN Stonehenge?” If one were to landscape one of these things with bonsai, pose Barbie and Ken dolls next to it, and shoot a photo after smearing Vaseline on the lens, you might show someone the photo and convince them it was a stone waterfall, were the person good and drunk. Friends don’t let friends do plastic waterfalls and ponds. 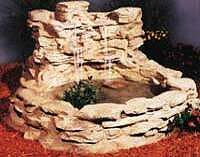 Use highest quality rubber liners, and build these things out of natural stone. Always make waterfalls fifteen to twenty-five percent larger/taller than your initial instincts, so you don’t finish it and realize it’s too small. Buy a good book on landscaping with stone, should you happen upon one. Still waiting. The book was delayed into February, then March, and now April because I wasn’t happy with some of the photographs (I don’t provide them, the publisher does). There is such a staggering number of new tree and shrub varieties dutifully written about in the book that Lone Pine, my publisher, has had to spend a great deal of time finding them and obtaining good photographs. The most recent word is that I should receive a few cases in about a week to ten days, with the book hitting the stores in mid-May. As soon as I have copies in my hot little hands, I’ll announce it on the Home Page, and you will be able to order the book direct from this site, at the same cost (even with shipping) as the stores. Incidentally, following Annuals for Minnesota and Wisconsin and Perennials for Minnesota and Wisconsin, the publisher has titled this last book in the series Tree and Shrub Gardening in Minnesota and Wisconsin, and I have no idea why. Good book though, and my favorite in the series. I have a great idea. This season, rather than stumble around and try to write something new for the updates every two to three weeks, while busy writing a monthly column for Mpls.St.Paul Magazine, writing my new column on perennials for Northern Gardener, scouting and directing photo shoots for Better Homes and Gardens, and running a full-time landscaping business, I’m going to bring you along on each landscaping job throughout the 2005 season. Description: Small, wide back yard in western suburbs of Minneapolis, USDA Zone 4. 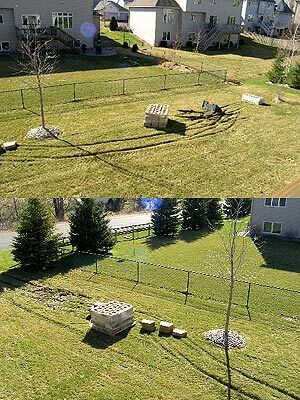 Problem to Fix: Yard faces neighbor’s back yard. Client wants privacy, wants to hide neighbor’s chain link fence, and wants a pretty view from her oft-used deck. 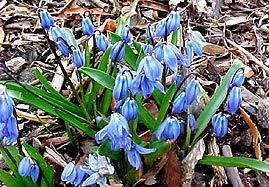 Solution: Create a curving, mixed deciduous/evergreen swath of plants to offer spring bloom, summer bloom, fall leaf change, winter interest, refuge for wildlife, and year-round beauty. Caveats: Soil is slimy, lethal clay. You could spin pots with this stuff, add two grooves, make ashtrays. Also, city requires a 10’ setback from chain link fence for neighborhood drainage channel. Extremely damp conditions.